Rev. Kit C. Yeaste, 94, of Bardstown, passed away peacefully in Williamsburg, Virginia on Saturday January 12, 2019. Brother Kit was born August 8, 1924 in Harrodsburg. In November 1944 he married his childhood sweetheart Sara (Thomas) Yeaste before going overseas where he saw combat service in Italy during WWII and earned the Bronze Star. Upon returning home he was called to the ministry and earned a Bachelor of Arts from Georgetown College and a Bachelors of Divinity from Southern Baptist Theological Seminary. 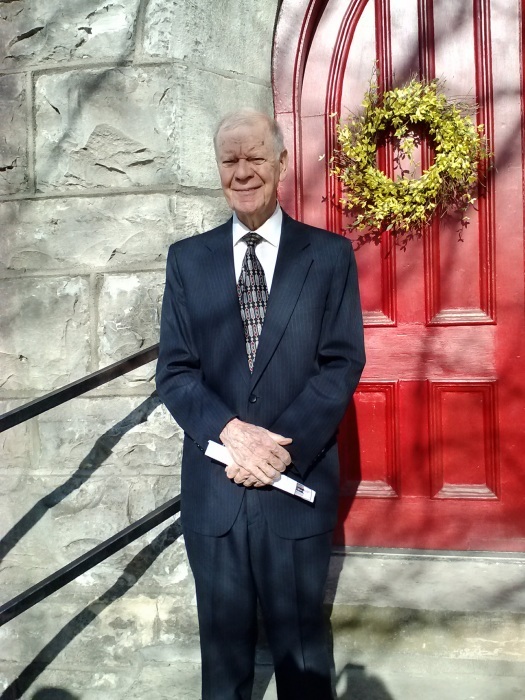 Brother Kit spent his life serving the Lord as the pastor of several churches in Kentucky and always spoke fondly as to how he started in the ministry. Eventually the Lord led him to the Bardstown Baptist Church, where he served as minister for more than 30 years. Throughout his career, he worked to break down barriers between denominations, classes and races to find common ground in the love of God. His love touched many people and several generations. He was preceded in death by his loving wife Sara Thomas Yeaste; parents, Edward and Gertrude Trower Yeaste; and all nine of his siblings. He is survived by his two daughters, Evelyn Gayle (Glenn) Snyder, and Kitty Carolyn (Daniel) Higginbottom; three grandsons, Timothy (Chris) Snyder, Matthew (Becca) Snyder, and James (Stephanie) Higginbottom; and six great-grandchildren. His funeral service will be 11:00 am Saturday January 19, 2019 at Barlow Funeral Home, with burial in Bardstown Cemetery. Rev. Jim Harris will officiate. Visitation will be 3 – 8 pm Friday January 18 and 9 – 11 am Saturday January 19 at Barlow Funeral Home.